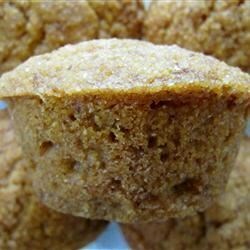 "This vegan cornbread is made with whole-wheat flour and sweetened with agave syrup. It got votes as being better than traditional cornbread muffins by my anti-vegan roommates! They can also be made macrobiotic if you substitute the agave with maple syrup." I doubled this recipe and cooked it in an 8x8. It took twice as long to cook and was a little too sweet, but overall very good.